There truly was very little to not like about how the Cowboys attacked the Seahawks. The Cowboys walked into that NFL playground, gave the biggest baddest bully a wedgie and stole his lunch money. If you didn’t watch the game and merely saw the score at the end, know this: it wasn’t really that close. 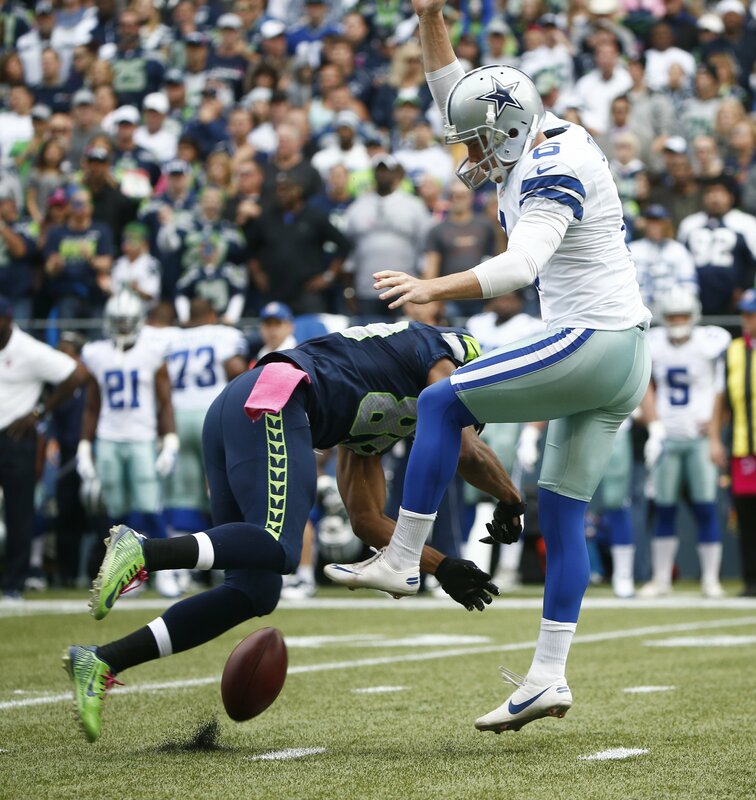 The Cowboys had a few miscues that afforded the Seahawks an opportunity to stay in this game. Punt blocked and returned for a Touchdown. Tough to point fingers here. This was a very well-executed/timed blitz by the Seahawks receiver Doug Baldwin to create a walk-in touchdown for Mike Morgan. The muffed punt. Two weeks in a row now, Dwayne Harris has been guilty of the worst possible type of mistake for a punt returner. This cannot become a trend if he wants to keep that job. The premature snap. Frederick sent it, Romo wasn’t ready. This particular gaff is par for that particular course, given the level of crowd noise in Seattle. The above accounted for 17 of the Seahawks 23 points. Without them the Cowboys would have blown out the Seahawks and one could make the argument avoiding those 3 turnovers very well could have led to additional points for the Cowboys given the overall offensive effectiveness in what was supposed to be a low-score outing. I won’t attempt to make that argument; I’m just pointing out there is a viable debate to be had. I said it last week, you cannot make mistakes against the Seahawks; they will make you pay…and they did…and it still wasn’t enough. True to form, the Seahawks did not make many mistakes themselves, save a few key penalties and the game-ending interception to Rolando McClain gift wrapped by Russell Wilson. It begs the question: Are the Cowboys that good or are the Seahawks not who we thought they were? I honestly do not want to take anything from that win…clearly the Cowboys are a much better team than what the football-watching nation thought coming into the season. The defense does have several players who have answered the questions that were looming over them in the offseason and they've answered favorably. Tyrone Crawford is ideal as a 3-tech DT. Anthony Spencer and Henry Melton look to be putting their injuries behind them and have steadily improved as the season progresses. Bruce Carter seems to be more comfortable a year removed from looking lost the majority of the time in the new 4-3 defense last season. Rolando McClain does care about football and has brought physicality to this defense that was lacking. Justin Durant can be a leader on defense and is quietly having a very productive season. JJ Wilcox has gradually made strides in making better decisions as a Safety and the angles of attack he has taken lately have been on point. Brandon Carr is much better in man coverage. Jerry Jones is looking like a genius in hindsight for locking up Scandrick, who is arguably the Cowboys' best defensive back. At this stage in their perspective careers, Rod Marinelli may be the better defensive play caller/defensive coordinator over Monte Kiffen. Add to that the confidence this team has - as a whole - now and we should see improvement as the season progresses and as various players get added to the rotation, like DeMarcus Lawrence and Josh Brent. Having said all of that, the Seahawks were exposed Sunday afternoon. Their lack of top-tier talent at receiver was made obvious. If a defense can remain disciplined and cut off Russell Wilson’s bail-out lanes, his lack of comfort being a pure pocket passer becomes evident. If a team can impose their will and run the ball, the Seahawks defense is nowhere close to being as vaunted as advertised. Along with shutting down Marshawn Lynch, therein is the blueprint for making Seahawks fans sleepless in Seattle. Granted, all of this is easier said than done and clearly the team has to have the right players with a high degree of discipline and focus to execute, but the less than stellar side of Sunday above and beyond the aforementioned big 3 is the fact that every team the Cowboys face down the stretch will present unique and different challenges. My predominant concern in regards to the Cowboys defense is their ability to effectively employ zone coverages against quarterbacks that thrive in the pocket, such as Eli Manning whom the Cowboys will face this upcoming Sunday. Given the comfort level the Cowboys displayed in man-coverage Sunday against Seattle's receivers, going forward teams will attempt to force the Cowboys into zone coverages. This means employing route combinations that feature drag and slant routes which I expect the Cowboys will be seeing a lot of against the Giants. Special Teams continue to disappoint, excluding Dan Bailey and the coverage teams. Blocking on both return units have been lackluster, we have seen far too many penalties, and – aside from the muffed punts of the last two games – Harris has also been seemingly tentative with picking his lane in both kick and punt returns. Poor blocking could certainly be part of the issue, but nevertheless, the best returners seem to break into a sprint from the point that they secure the rock and do not stop until they hit a human wall or the end zone. While it is my personal belief that average points allowed (Cowboys ranked 8th in the league allowing 21 points per game) is a far more telling stat as compared to yards allowed, even so, the Cowboys presently rank 29th allowing 6.1 per play. Therefore, the one disconcerting truth that all fans should accept is that these Cowboys cannot depend on their defense to carry the team. The Cowboys are very much reliant on the offensive line and DeMarco Murray sustaining their current level of performance. All of their liabilities considered, the Cowboys can ill-afford to become complacent and/or start harboring the belief that they have arrived. Thus far winning has blinded the casual-watchers to many of their shortcomings, particularly on defense. These deficiencies, however, are not lost on the Cowboys coaches and by extension, the players. But if there is any sense of entitlement among the players, it will become obvious this Sunday afternoon as the Giants will give the Cowboys their best effort to stay relevant and in the playoff chase. I am 35, married and a father of 2 boys. I have been a Cowboys fan since Jimmy Johnson took over; not because I had anything against Tom Landry, but because it just so happens I was old enough to start following and understanding football right as that new era began. Since then, I haven't missed games if I could help it.